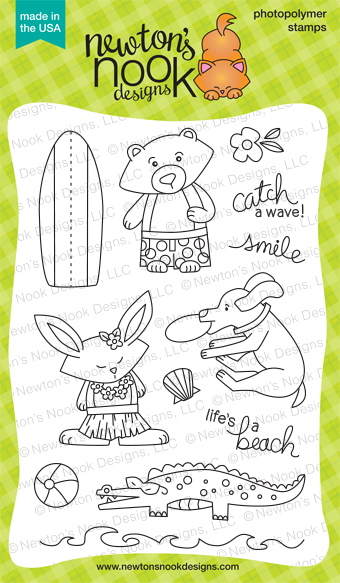 Newton's Nook Designs: NND July Release - Day 2 - Beach Party! 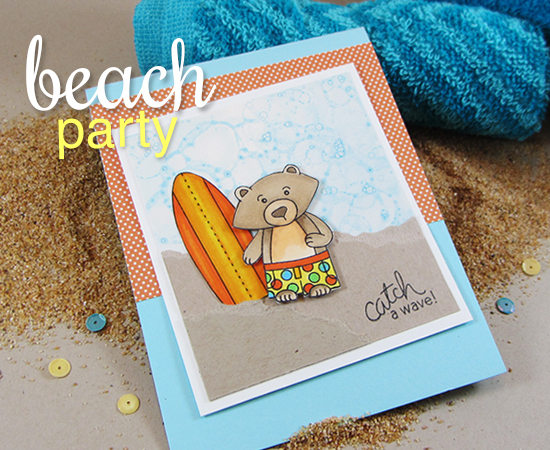 Today our first release day for July and we are featuring the set Beach Party! Ready for some Beach time fun? Lydia created this gorgeous beach scene - LOVE all the bright colors! Samantha created this cool card with the fun motion effect on the dog! Love the gold sun too! Larissa went a bit extreme on her paper-piercing - check out ALL those tiny flowers - so beautiful! 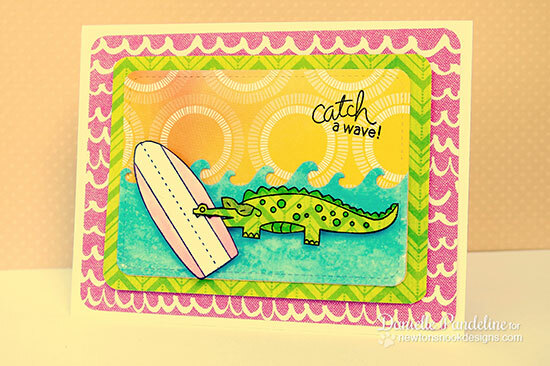 Love the color and pattern on this card by Diane! The plaid polka dot shorts on Winston are TOO CUTE! 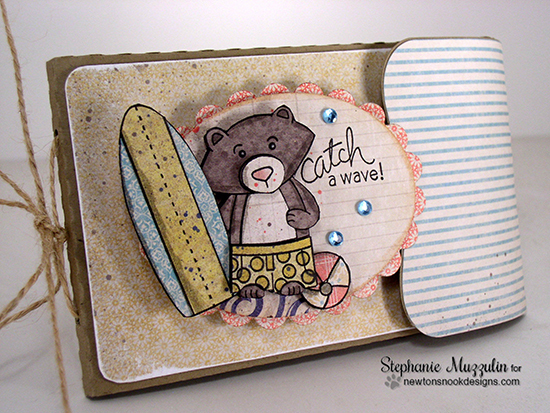 This cutie by Danielle made me smile - love that he's carrying the surf board! 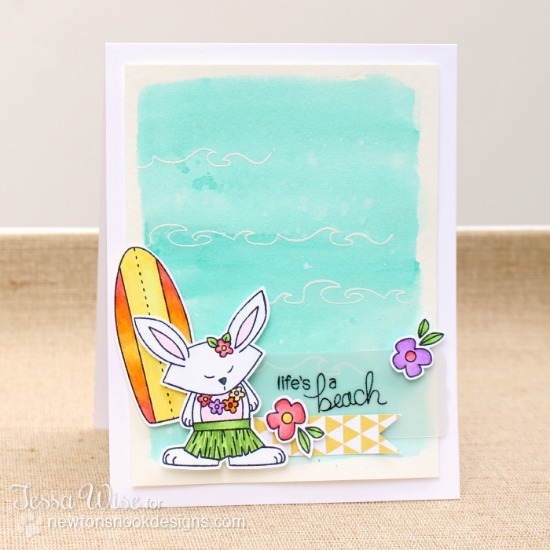 Tessa said this hula dancing bunny made her smile - and this adorable card makes us smile too! Taheerah created a fun post card image using Winston - ADORABLE! Stephanie created a fun little mini album - make sure head to her blog to see the whole thing! 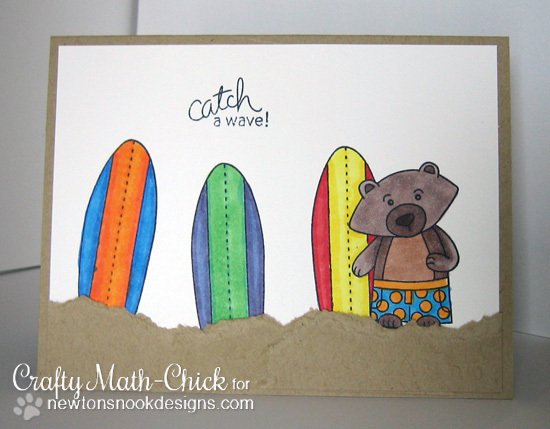 Crafty Math-Chick created this fun beach scene with Winston and some surfboards - which one will he take for a ride, I wonder? 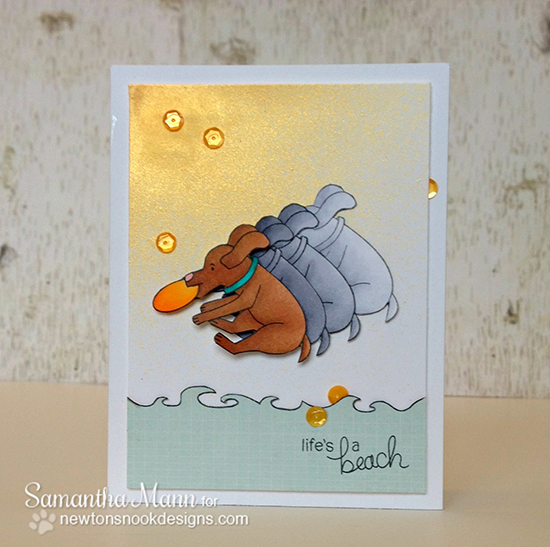 This card by Shellye is super fun - love all those beach balls!! 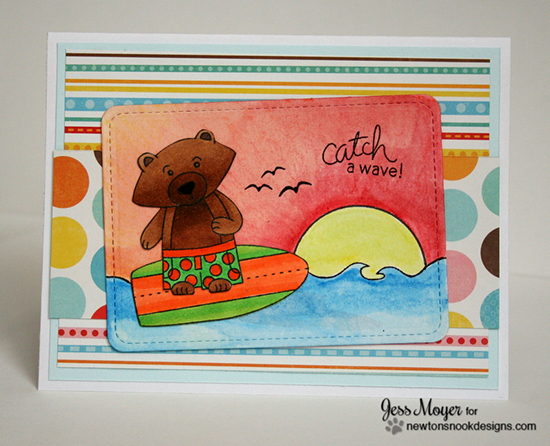 Jess created this gorgeous surfing scene with Winston! So bright and cheerful! Would you like to win “Beach Party”? Oh, these images are too cute! And the projects are spectacular!!! Adorable set!! What fun images!!! Beach Party set is so Cool! 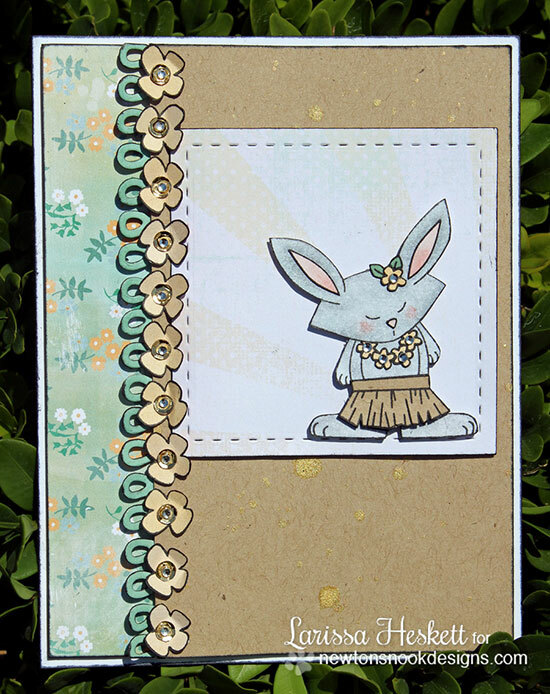 Your creativity in designing this darling set is amazing, Jen - and the DT have really flown with it, designing a set of wonderful showcase cards! So much fun!! So many cute images in this new set! Your DT made such gorgeous creations! I've hopped through all the blogs except one, so I'll check back for Shellye's post later. Thanks! I came back as promised and I was able to visit Shellye's post and see her adorable card! Fun blog hop - thank you! Like the set and the cards made. A great stamp set. Some different ideas - the dog catching the frisbee and the alligator. The cards were great on the hop. So many cute ideas. Thanks for having the hop. Very cute set--love the dog with the frisbee. So many great cards! I love seeing what the other ladies have made! What great cards and love the beach party theme. Such a great selection of fun cards! Thanks for sharing everyone. This is such a CUTE set. This set is adorable! LOVe that frisbee playing dog! What a fun and cute set! Love the dog playing frisbee...too cute! I was so excited to see such a cute set for today!! I am really enjoying this release - I can hardly wait til tomorrow to see what you and your Design Team come up with next!! Everything has been so perfect and clever so far!!! Fun set> I love the hula bunny and the crocodile! What an adorable set! The DT did an awesome job showcasing the new stamps! Awww... This stamp set is so adorable! Oh wow, this stamp set is so cute! All the DT's projects are wonderful! So much talent and creativity! Thank you for great inspiration. These stamps are so cute. I just LOVE that dog with the Frisbee. so so so so excited for this release!! these cards - swoon!!! magic happened!! can't wait to see what the rest of the week has in store!! jennifer - how did you make that background on your card?! i LOOOOOOVE it!! is it bubbles?! oh my goodness! so many new ideas in my head!! awesome awesome favorite card!! Winston in his beach-wear is too much! So sweet--love the possibilities with the big bright surf-board, too. Fun set! I love it! I love Winston in his beach attire! I love all of the cards, too! I love the beach. See many chances to use this one. Great DT Cards. Adorable! Winston and the bunny in their beach wear are so cute! Very cute set. I love the critter sets.